Unblock VPN is a well-known VPN service provider. Founded in 2009, the service is brought to you by a Czech Republic based company which has a lot of experience in delivering internet based security services to its customers. In the detailed Unblock VPN Review below, we look at some of the distinguishing features offered by the service and judge whether it is worth our time and money. Unblock VPN has VPN servers in 6 different countries – United States, Netherlands, Sweden, Czech Republic, Slovakia and United Kingdom. While some important countries (such as Canada) are missing from the list, using Unblock VPN’s service would undoubtedly help you to unlock GEOIP restricted services like Hulu, BBC iPlayer, Rara, Netflix, Spotify, Last.fm, Amazon Prime videos, Pandora, 4OD, Fox, HBO Go, Demand 5, CBS, NFL, ABC, iTV and NBC from any place in the world. The service would also assist you in bypassing firewalls imposed countries like China, Middle East, Thailand etc. and unlock services like Gmail, Skype, Facebook, Blogger and YouTube even if they are blocked by local ISPs. Since the company allows unlimited server changes, you can unlock local content from all the 6 countries listed above. 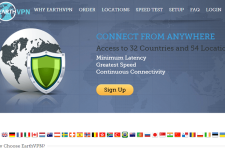 Unblock VPN offers unrestricted bandwidth and blazing fast speeds to its customers. The customers of the service can download unlimited content, play online games, make VOIP calls and stream live events and movies without facing any bandwidth issues or speed throttling. The company reserves the right to limit bandwidth in case a customer uses more than 2 GB of bandwidth on a daily basis for several days in a row. The company allows peer to peer sharing through Swedish and Slovak servers which should please those customers who are looking for an anonymity solution for their bittorrenting activities. Unblock VPN delivers privacy and anonymity on the internet through PPTP, SSTP, L2TP (with IPSec) and OpenVPN protocols. Although PPTP and L2TP protocols are known for their compatibility, SSTP and OpenVPN protocols deliver the highest level of security. As soon as you are connected to Unblock VPN’s server, your every online activity such as browsing, emailing, FTP, messaging and VOIP would get full protection from hacking and theft. 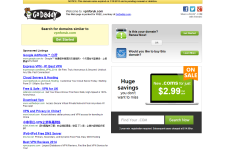 The service is also ideal for those who access the internet primarily through Wi-Fi sessions. A lot of free wireless networks (commonly available at malls, airports, hotels etc.) have a very poor track record of security so hackers and cyber criminals often use them to steal data and identity. Unblock VPN does not spy on its customers’ online activities. The company keeps bare minimum logs for system maintenance and troubleshooting but this data is never handed over to third parties. The company does not sell or exchange user data with other companies or advertisers. Unblock VPN is available for Windows (8, 7, Vista, XP), Mac OS X, iOS, Android and Linux. While the company recommends using PPTP and L2TP protocols for mobile devices (iPads, iPhones, Android tablets/Smartphones), OpenVPN offers great security for desktops running on Windows, Mac and Linux. The company even offers SSTP protocol to help you to anonymize your online activities in case other VPN protocols are blocked by your network administrator or ISP. The setup is quick and painless and the company offers detailed step-by-step setup instructions for all devices and protocols through its official site. The company offers an email based customer support system. The company’s support staff is very responsive and you should get answers to your technical and administrative queries within no time. You can also refer to Knowledgebase and FAQ sections in case you face recurring connection issues. 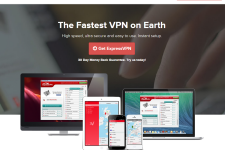 Unblock VPN offers unlimited plans with dynamic and dedicated IP addresses. The dynamic IP VPN plans start from $4.99 for 30 days ($49 for 1 year) while the dedicated IP plans start from $9.99 for 30 days ($99 for 1 year). The company offers a free 3 day trial for testing speed and connectivity of the service. The trial is limited to 5 minute sessions but you can access the service 5 times a day. The company does not have a refund policy so it is a good idea to test the service before buying a long term plan. 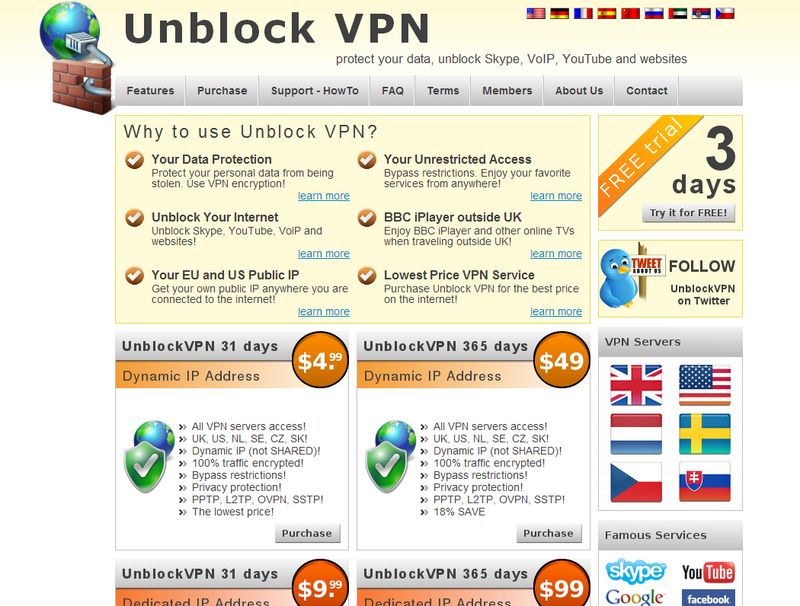 Unblock VPN offers a reliable and secure VPN service. While the company has limited number of server locations, it scores well on speed and bandwidth parameters. 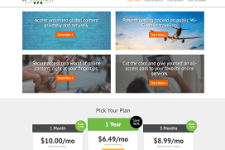 So if you want to subscribe to an affordable and dependable VPN service, check out the VPN plans from Unblock VPN. For more information, please visit: www.unblockvpn.com.